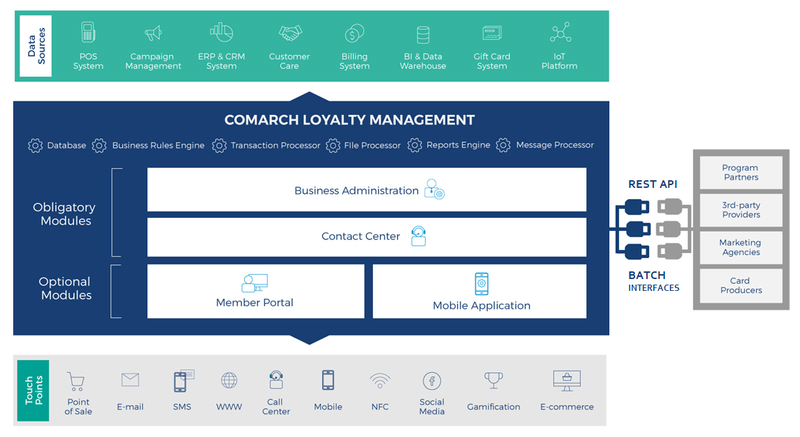 Comarch Loyalty Management (CLM) Cloud is a comprehensive, modular platform that allows you to efficiently manage the entire loyalty program lifecycle. Providing a wide range of features designed to help you build successful marketing strategies, it stands out as a highly practical and cost-effective solution available in a subscription-based pricing model. You can fully enjoy the state-of-the-art features of CLM Cloud just a few weeks after you sign the contract. Our solution enables you to bypass the time-consuming project implementation process and, therefore, achieve better business results in no time. With the use of CLM Cloud, you can create and manage engaging loyalty programs, better interact with your audience across multiple channels, and track loyalty system performance in real time. Start using our Cloud solution today and discover brand-new opportunities that will prove essential for your company’s growth. Our goal was to deliver a solution that is both robust and affordable. As a result, not only does CLM Cloud deliver a complete set of advanced loyalty management functionalities, typical for the Enterprise version, but it also proves to be highly cost-effective thanks to monthly subscription fees. Therefore, the cost depends on the number of transactions you make. The system supports implementation in the stand-alone and multi-partner models, ensuring full accountability both at the level of cooperation with partners and in the context of loyalty program participants. Comarch has gained its experience from the many years of developing advanced loyalty management solutions as well as carrying out hundreds of projects across the globe. Each of those projects, realized for some of the world's best-known brands, are a true testament to the system's reliability. Our solution supports real-time management of program registration, segmentation, marketing campaigns, rewarding and multi-channel communication, as well as fraud protection and reporting, all within one tool. Apart from delivering a wide range of practical and cost-effective functionalities, CLM Cloud was designed to always keep up with the latest system updates, introduced in accordance with the Comarch roadmap. The system enables seamless business configuration in relation to the retail aspects of loyalty programs, as well as facilitated integration with external systems thanks to the Open Rest API and file interfaces. If you find it necessary to increase the possibilities of your system, it is possible to upgrade your CLM Cloud to the Enterprise Version without losing any data or causing any unwanted interruptions to your loyalty programs. CLM Cloud enables efficient, real-time data exchange with external sources such as cash registers, EPR & CRMs, Business Intelligence (BI) and DATA warehouses, as well as dedicated billing & gift card systems. At the same time, it supports omnichannel communication in real time through integrated channels based on dynamically changing customer attributes. Enjoy the full spectrum of simple to advanced loyalty management services. Add more features in order to explore new business possibilities. A module that supports all of the administrative functions, necessary for the system configuration. It is also a professional tool for administrators and business users providing them with valuable operational functions. A module that gives you access to the full data insight of your loyalty program members. It was designed to streamline the processes related to the management of program participants, their accounts and communication history. A set of interfaces for integration with external applications, including access to the REST API and file interface. A powerful mobile application, available for iOS and Android, which provides participants with their loyalty identifiers, membership details, loyalty program-related activities and transactions - all available at the palm of your hand. A website that provides participants with instant access to information about their membership details and the history of transactions. We guarantee contact with Comarch specialists during the business configuration of your CLM Cloud. The system will be set up using your relevant company data and configured so that it could perform business-defined tasks efficiently. Trainings conducted by Comarch specialists will give you all the information about how the system works and what practical functionalities it offers for your business. Our technical support services are available 24/7. CLM Cloud is also regularly updated in order to provide clients with instant access to the latest functionalities and improvements. We provide our clients with complete system documentation, including all e-documents necessary for how to use the system, describing functions, operations and interfaces in detail, enabling flawless integration with external applications. The three packages offered by Comarch guarantee choosing an offer that meets your needs best. Both the scope and the duration of the Managed Services can be adjusted to your requirements. We enable facilitated integration with third-party applications; those provided by Comarch or certified Comarch partners. Your Cloud is just a few steps away! You are not far from enjoying the capabilities of our CLM Cloud solution. There are three basic steps ahead of you. Let us take you through them. Our Loyalty Management system has been appreciated by many entrepreneurs who constantly inspire us to improve the CLM so it could better serve their business needs. Not only can we provide you with a robust & reliable solution for marketing automation but we can also guarantee that you will be satisfied with its capabilities. With this CLM being a Cloud solution, it is available in a subscription-based pricing model. It means that you don't have to pay any license fees or go through the time-consuming implementation process. You can launch your new loyalty program as soon as you decide to use CLM Cloud. We always assist our clients, helping them go through the system configuration process which is essential for the success of their loyalty programs. Firstly, our experienced specialists will train your employees to initialize the system correctly. Then we will help parameterize it in accordance with your business strategy. We can assure you that using Comarch solutions is always easy and intuitive. To ensure the best omnichannel experience possible, we also offer integration with the already existing clients’ systems. It's time for you to start using CLM Cloud to your advantage - loyalty management has never been so user-friendly. Modify your settings in terms of signing up, awarding points, receiving rewards, contacting your support center, or reporting. Our configuration tools will be accessible to you, and the other authorized CLM Cloud users, at any time. Interested in a licensed implementation model?